Our Studios come complete with kitchenette, microwave, two hot plates, frypan and fridge/freezer. 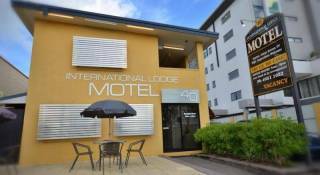 Fully air conditioned, 32" LCD TV, Foxtel, iPod/iPhone charger and access to a communal washing machine and clothes line. Free Wifi, Free Parking. 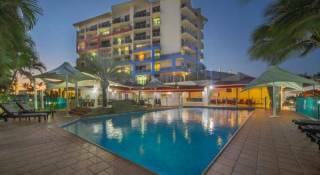 2 bedroom Beachfront Spa Duplex with lounge & dining, full kitchen, washing machine & dryer. 32" LCD & DVD. Large Oval 2 person spa in bathroom. 2 Queen Beds & 2 single beds in an alcove.Use of Private pool,with magnificent views to the Coral Sea. 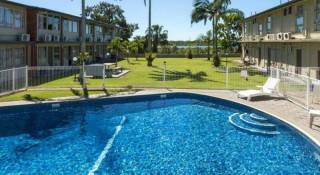 Comfort Resort Blue Pacific is a quiet 4 Star self-catering Apartments with beach frontage offering guests spacious studios, one, two and three bedroom villas and townhouses set in lush tropical gardens on the beautiful Northern Beaches of Mackay only 15 minutes from the CBD. You can escape, unwind and have fun exploring the golden sandy beach or sit and relax under the palm trees on our grassed beachfront overlooking the Islands. 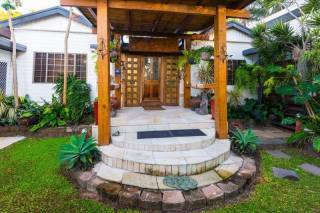 The property caters for both the corporate and holiday guests both for short term or long term stays or relocation to Mackay. All Linen is provided and all units are serviced once a week. The Resort has local eateries and a shop within walking distance (a tavern, a Chinese restaurant and fish and chips shop)and we can provide continental breakfast packs and have a small selection of ready to eat microwavable evening meals and drinks available. We look forward to welcoming you to Comfort Resort Blue Pacific. For check-in afterhours we provide a night safe. All guest need do is pick up the night phone. Cancellation policy: Minimum 48 Hours (all). No Smoking in any unit. Mackay Airport - You can hire a car or travel by Taxi. Follow the road to the Bruce Highway (Nebo Rd) and travel as you would to go to Townsville. After you cross the Pioneer River you take the Mackay/Bucasia Rd Exit to your right (Northern Beaches exit) and follow the signs to Blacks Beach. 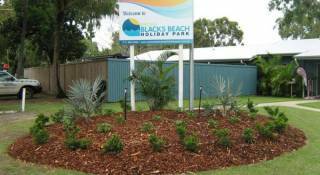 Once you turn into Blacks Beach Rd we are the fifth street on your Left (Bourke St) and have a sign on the corner to direct you. From the North travelling on the Bruce Highway you take the Northern Beaches Exit to the Mackay Bucasia Rd. At the Roundabout turn left into Mackay/Bucasia Rd and follow the signs to Blacks Beach. Once in Blacks Beach Rd take the fifth street on your left (Bourke Street) and we are number 26. Local bus services operate Monday to Saturday with a limited timetable on Saturday. The bus stop is located in Bourke Street 20 metres from the Resort.